BUILDING is being considered to become an Historic Cultural Monument. The Farmers Insurance building tower at 4680 Wilshire Blvd. is being considered to become a Historic Cultural Monument, and the application was unanimously approved at a meeting of the Cultural Heritage Commission in December. The 1920s building and surrounding 10 acres were purchased by CIM developers in mid-year. Community residents attended the meeting to support the application that would halt any alteration to the building until a decision is made on the proposed status. Marcello Vavala of the Los Angeles Conservancy said the Commission’s action will put a hold on any development for the property while the application is pending—which is likely a period of about six months. The city’s Office of Historic Resources will send a formal letter to CIM this month informing them that the property has been taken under consideration for local landmark status. Next step, said Vavala, is to obtain written support from Councilman Tom LaBonge’s office, in addition to reaching out to other advocacy groups to support nomination efforts and demonstrate wide-ranging support. Brookside resident Laura Foti Cohen gave a presentation on the building and its historic significance. 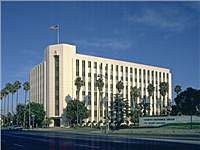 The application was submitted on behalf of the Windsor Square-Hancock Park Historical Society and the surrounding neighborhoods. An on-site evaluation by the commission is expected in January.